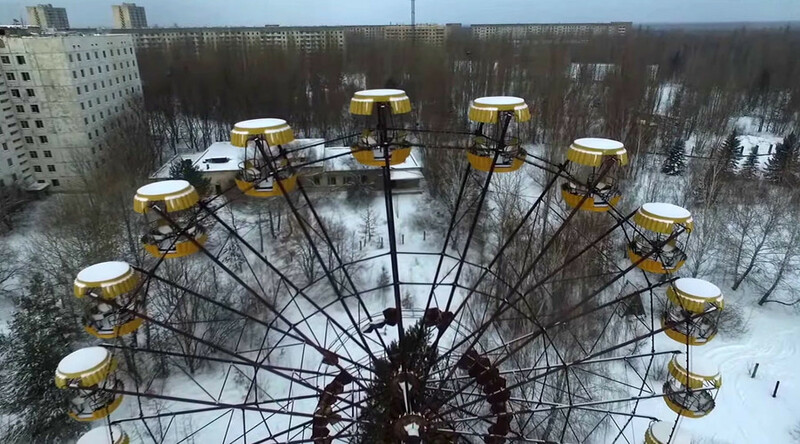 Haunting drone footage of the Chernobyl exclusion zone city Pripyat has been released online ahead of the nuclear disaster’s 30th anniversary. The bird’s-eye video conveys the eerie desolation of the abandoned city, blanketed in snow. Starting at the city’s central landmark, the Palace of Culture, the camera takes in the ferris wheel that never operated, the former school, the city’s hospital, and a derelict swimming pool. A catastrophic explosion at the Chernobyl nuclear power plant on April 26, 1986 was directly responsible for 31 fatalities. However the Chernobyl Forum predicts the eventual death toll could reach 4,000 among those exposed to the highest levels of radiation. Some 6,000 children are born every year with genetic heart defects and seven million people living in the affected areas received the highest known exposure to radiation in the history of the atomic age, according to Chernobyl International. A massive steel and concrete sarcophagus was built to cover Reactor 4 and contain radioactive material at the site after the disaster. A replacement protective cover is being constructed to prevent the reactor complex from leaking radioactive material into the environment, while allowing future partial demolition of the old structure. The new containment device was due to be completed in 2005, but the project has gone through several delays, particularly down to funding problems. The completion date is now set for 2017. Last April, the Chernobyl nuclear power plant officially launched the decommissioning and dismantling of its first three units. Kiev allocated $30.2 million for the decommissioning project which is expected to take at least 10 years. While long-term access to Pripyat isn’t allowed, tourists can make short trips to see the impact of the nuclear disaster and evacuation for themselves.